I am one of those people who leaves the card on my bed at the hotel because I want the linen changed each day (give me a discount, and I might not). As I reached for the card at my last hotel stay, I read something that made a lot of sense. 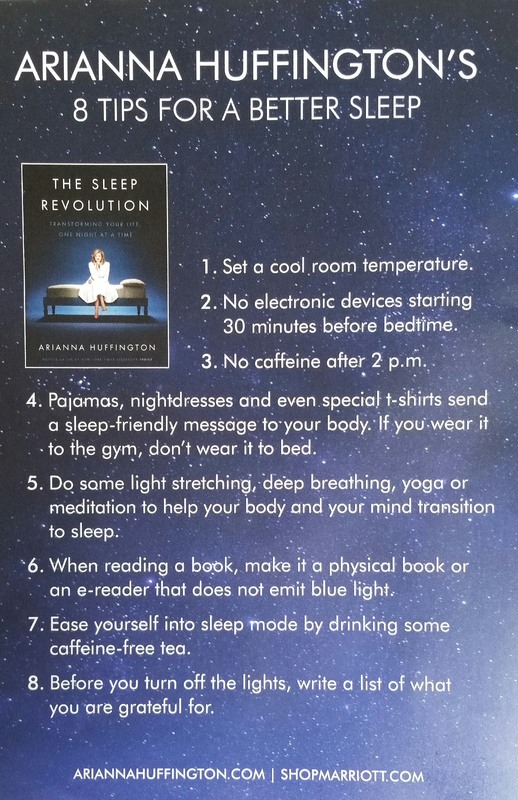 It was Arianna Huffington’s 8 Tips For A Better Sleep. As I have matured sleep has become more important. At one time I could function very well on 4 to 5 hours of sleep, but as I have matured I need more. As women of a certain age sometimes our sleeping patterns can go into some craziness because of the dreaded menopause. You know, you just can’t get to sleep, or you wake up and then you are just up for the rest of the night. Will her 8 tips work? I’m not sure, but I do agree with trying them. There are some things that I probably won’t do. I can drink coffee at 10 PM and then go to bed, and it does not bother me. Take a look at the list and hopefully you will get some idea(s) on helping you get a good nights sleep–it’s worth a try. Sleep does make you feel better and even look better. 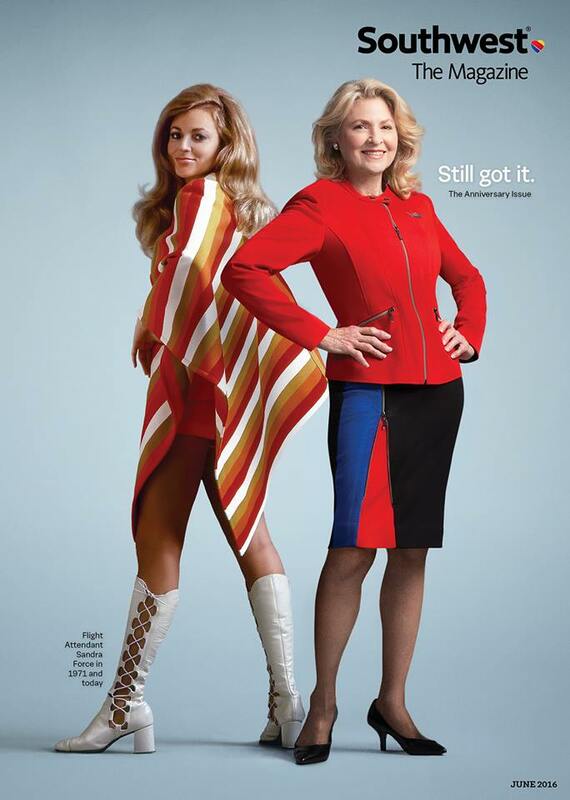 Ms. Huffington has written a book about the importance of sleep in our everyday life–The Sleep Revolution. It sounds like an interesting read. Remember “thisisyourbestyear“. Have a good nights sleep. Sweet dreams! In the comment section, tell us some of the things you do to get a good nights sleep. When it comes to starting my work day, I am a creature of habit. Some of the habits were added as I matured, but a few have always been set in place. I’m not talking about brushing my teeth, washing my face–things that everyone should do. I’m talking about things that help my day go better. I’m not saying this is how you should start your work day, but give it a try–it may help. I always start the day off in silence. A minister told me once that you can’t hear God with all the noise–television, radio, etc. Here’s how I start my day. Prayer–I always start (and end) my day thanking God for waking me up. Sometimes all I can say is “thank you, thank you”, and ask blessings on my family and friends and a few others. The prayer can be long, short or in between, but it is always a prayer of thanksgiving. Even when I don’t feel well–I still pray. While my coffee makes, I do stretching exercises. Don’t laugh, they really help. You can hear your bones popping, and feel the stretching. Watch a cat get up from a nap, she never just gets up and moves, she stretches–slowly and then she is off. Take about 5 minutes, sit on the floor, lay on the floor however, you want to do them. You can find some easy ones online or just make up some. The point is stretch. While drinking my coffee, I read my devotional. One of my favorites is by President Jimmy Carter. It gives you scripture, but it also gives you daily examples that pertain to the scripture. I like this devotional because you don’t have to do it in any particular order. You can find a great many online. I finish my coffee with a little something for breakfast. In all honesty I try to eat a little something healthy–oatmeal, toast (avocado toast is amazing), fruit and nuts or just toast and jelly. Yep real butter and jelly. I finally turn the television on. I turn to the local news. It seems that the local news has more good news than the national news–local sports, girl scouts, paying it forward, etc. (I watch the same local news each day, we’re on a first name basis). I have to see about the weather forecast and the traffic report. While looking at the news, I look through the local paper. After the local news, I look at about the first 10 minutes of the national news to make sure we as a nation are still okay. That’s about all I can take. When I have had enough national news, I find something funny to watch while I get dress for work. It is usually an old comedy rerun. They make me laugh, smile and warm my heart. Laughter will allow you to keep calm when you are cut off in traffic–seriously it works. It may seem that this is a lot, but I have it down to a science. If I miss a step, it seems that my work day is off. Each of the steps has a purpose, and flows directly into the next step. Remember “thisisyourbestyear”. Start your work day off to a good start–it takes planning.